Destroyed during the war, Cholon's market was rebuilt. Mention the word, ‘Tet’ and Americans old enough to remember the Vietnam War think of the infamous Tet Offensive of 1968, the most violent period of the conflict. But those memories are really only the American view of Tet. To the Vietnamese today, Tet is celebrated as the lunar new year, their most important holiday, and a time to be with family. It is a time to forget about the bad from the past year, and hope for good luck in the new. It is a time for a new beginning, and a time for forgiveness. This attitude has helped the Vietnamese get past the war, and start new relationships with their former enemies, the French and the Americans. As the Tet new year approaches, preparations across Vietnam begin in earnest. All the markets are busy, as families buy food, gifts and decorations for the home. The atmosphere is similar to Christmas. Relatives return home from far and wide, and every house is thoroughly cleaned in preparation for the big day. When the morning of Tet arrives, the day is considered everyone’s birthday, since a new year has turned. Red envelopes are given as gifts, containing ‘lucky money’. Everyone traditionally wears their best clothes, and dines with family. By the next day, the atmosphere is more relaxed, and in the back alleys of the city, groups of neighbors gamble on tablecloths laid out on the ground. They are gambling away their ‘lucky money’, a tradition that’s technically illegal, but tolerated by the authorities during Tet. As I wander the streets of the city, the holiday has thankfully transformed traffic for the better. In the days after Tet, downtown streets are no longer crammed with rush hour traffic. The streets are practically empty, as everyone is at home with family. Most businesses are closed. Compared to its usual hustle and bustle, downtown HCMC becomes almost a ghost town. Tet is now even quieter than it used to be, since fireworks were taken off the streets. In years past, fireworks injuries during Tet were common. There were also fatal accidents at fireworks factories, so the government banned their public use in 1995. Fireworks exploding in Vietnam these days are from government sponsored shows. Two days before Tet, I grab a taxi and head for Cholon, the city’s Chinatown. The Tet holiday transforms Cholon, and all of HCMC for that matter. Driving along Cholon’s busy streets, we pass shops full of red decorations and holiday gifts. Lined up one after another, they form a sea of red, the color of good luck. The word Cholon means ‘big market’, and way back it used to be a separate community founded by Chinese traders. Saigon gradually grew closer to Cholon, and now the city completely surrounds it. Cholon after the 1968 Tet Offensive fighting. Photo from Wikimedia commons. When the Tet Offensive happened in 1968, Cholon saw the worst fighting in all of Saigon. The Viet Cong managed to take control of the entire neighborhood. Saigon had been relatively safe before the offensive, but for the first time during the war, airstrikes and artillery were being dropped on targets within the city itself. It took weeks of fierce fighting for the US and ARVN armies to take Cholon back. When the smoke cleared, whole blocks of Cholon had been burned to the ground. Cholon has since been totally rebuilt. Burnt out homes were replaced by shop houses and tall apartment buildings. In the cool of the evening, I walk past the new Binh Tay Market in Cholon, which replaced the old market destroyed in the heavy fighting. Binh Tay is now one of the cities more impressive, modern looking markets. 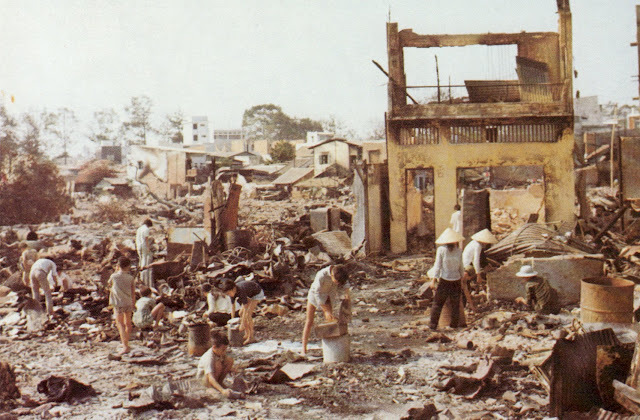 After the war, 1978 brought a new disaster to Cholon. As the communists continued their revolutionary ‘reforms’, they cracked down further on capitalism. Cholon’s Chinese community has always been well known as merchants, and the crackdown wiped them out economically. The next year China and Vietnam fought a border war in the north, and the Vietnamese government hit the Chinese minority even further. Thousands of ethnic Chinese were persecuted more, lost their property, and fled the country in droves as boat people. Cholon was changed forever, as many Vietnamese moved into the neighborhood, taking over the houses of the departed refugees. I ponder all of this as I get out of the taxi, and wander Cholon’s streets. As I pass many shops and restaurants, I get curious looks from the occupants. Few westerners venture into this neighborhood. I’m searching for someone that is ethnic Chinese to talk to, but can’t find anyone that speaks English. I do encounter Mai, one Cholon merchant who speaks English well. When I first saw Mai, I guessed that she was ethnic Chinese, but I was wrong. “I no Chinese, I Vietnamese,” she told me proudly. Her shop is her own business, and she sells jewelry. Business is going well. For Mai and other business owners in Vietnam, these are the fruits of doi moi, the government's economic reforms begun back in 1986. Following the example of China before it, limited capitalism and free markets were reintroduced to the country. As doi moi picked up speed, the new policies brought in much needed modern technology, tourist dollars, and foreign investment. Cholon’s merchants made a comeback, and Mai became a young entrepreneur. Things weren’t always so rosy for Mai and her family. Unfortunately for her, she was born in Saigon at the wrong time, into a family that ended up on the losing side of the war. Years later her father was finally released from the ‘re-education’ camp, but getting work was difficult . Like other ex-ARVN soldier’s, he was banned from holding a professional job ever again. He went from being an army colonel, to a bus driver. He died a few years later from a heart attack. As the years toiled on, Mai and her family survived. As she grew older, her good looks brought her work as a part-time model. A marriage ended in divorce, but after that her jewelry business began to prosper. Some time later, Mai met a German who owned a trading business in the city. The two fell in love, and he asked her to marry him. Things were looking up in her life. One day, I called Mai on her mobile phone. She answered sobbing. Tragedy had struck again. Her fiance had committed suicide. He had apparently hung himself. Mai had told me earlier that he was having business trouble, but there was no indication that things were this bad. In addition to her own heartbreak, she had to deal with her fiance’s distraught family, who soon traveled to Vietnam to take his body back home. Months later, I started seeing Mai out and about socially again. She was quiet, but at least she wasn’t sitting at home. Mai has to be one of the strongest women I’ve ever known, possessing not only a strong will, but a strong heart. It will take time for her to get over this tragedy, but like Vietnam itself, she has suffered repeated tragedies, endured them, and moved on. Most Vietnamese are Buddhists, and for them, everything is temporary. There are countless stories like hers in Vietnam. I’ve often wondered people like Mai can suffer so much, and still manage to get on with life. Maybe they were born with more strength than others. Or maybe it’s because they have no other choice, but to go on. Over time, Mai and I stayed in touch. Since her shop’s humble beginnings, her business expanded. She’s come a long way from the poverty of her youth. She now earns enough to not only take care of herself, but also her aging mother. “Now I have two store,” she told me. I admire this woman. She's been through a lot, survived, and thrived. Despite all the difficulties life has brought her, she's still had the strength to move on, and prosper.